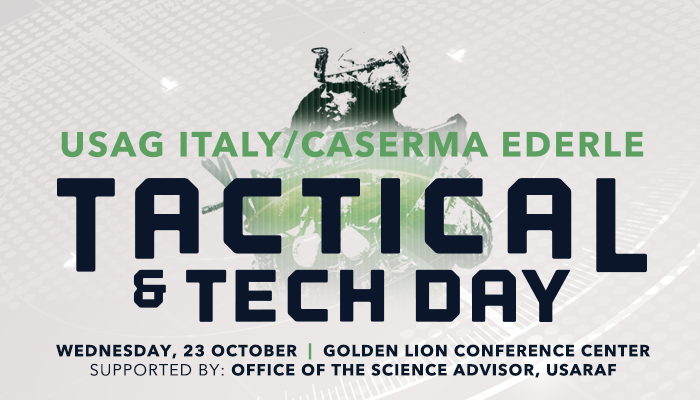 The annual USAG Italy/Caserma Ederle Tactical & Tech Day will take place on Wednesday, 23 October 2019 from 0900-1300 at the Golden Lion Conference Center. The Tech Day is an event to bring government and industry together to collaborate on mission requirements and technology solutions in an open environment. Industry partners will be showcasing the latest mission-centric technologies. This is an opportunity for the organizations and units structured under USAG Italy, U.S. Army Africa, and other tenant units to see the latest in emerging technologies, network with industry experts, and share ideas and future goals.